The latest version of Windows named Windows 10 Fall Creators Update is here with lots of improvements. Here is how to update your PC. Windows 10 Fall Creators Update (version 1709) started rolling out on October 17, but that doesn’t mean everyone will get the update immediately. Windows 10 Fall Creators Update follows phased rollout approach, which means that it will first roll out to newer devices, then gradually to other compatible devices based on the received feedback. Fortunately, my seven years old PC got the update automatically! Before downloading the update, make sure your PC can run it. If my PC can run it, yours will definitely! But it doesn’t hurt to check the exact specifications if you have an old PC. Refer this page if you want to know the minimum system requirements. If you are into Mixed Reality stuff, you will need a more powerful one. For those, refer this page. Having confirmed that you can run the update, there is no need for waiting to grab the update! Windows Mixed Reality – Windows 10 Fall Creators Update brings mixed reality and 3D content to the masses with Mixed Reality Viewer & Paint 3D. Photos – The new Photos app allows you to add filters, text, 3D effects and create memories out of your media with themes, soundtracks, and transitions. There is also a cool feature that allows you to anchor text to a moving object. My People – You can pin your favorite people to the taskbar, share files directly to the pinned contacts by dragging and see emoji animation. Microsoft Edge – You can pin your favorite websites to the taskbar, annotate books, edit URL for Favorites, and other improvements. Security – To protect against ransomware attacks, there is a new Windows Defender Exploit Guard and Controlled folder access feature. PC Gaming – There are several improvements such as Game Mode, Mixer, new help options, and viewing GPU performance in Task manager. Voice-activated Power Commands in Cortana. Use the keyboard shortcut Windows key + period (.) or Windows key + semicolon (;) to open the new emoji panel. There are still lots of features that arrive with the Fall Creators Update. Are you fascinated by the features? Let’s go to the main part: Downloading the Fall Creators Update. Click the Start button and then Settings (gear icon). You can also go to Settings directly by typing it in the Search Tab. Then, select Update & Security > Windows Update. What to do to download the update right now? If your device is not eligible for the rollout at the moment, you can manually install the update. For that, you need to go to Microsoft software download website and select Update now. 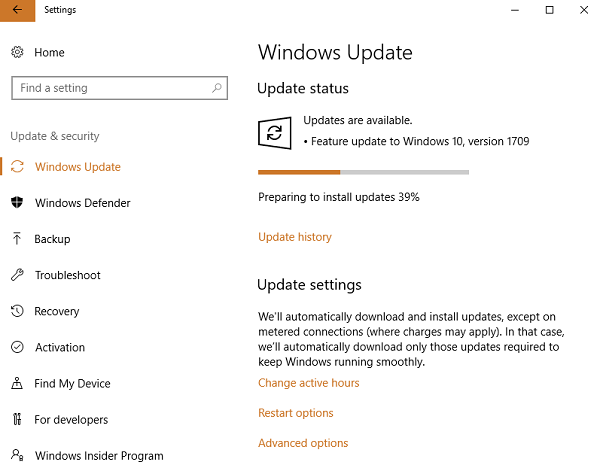 The Update Assistant tool will download. Run it and click Update Now. Then, follow on-screen instructions to install the update. Another way is to update using media creation tool. You can even perform a clean install with this tool. Download the tool by clicking Download tool now on the software download site and run the tool. Select Upgrade this PC now to start the update. Then, make sure that Keep personal files and apps option is selected and follow on-screen instructions to install the update.